It’s good news to hear that City of Darwin has decided to reduce its plastic waste by banning specific single use plastic items from all Council-run events and all market stalls held on Council land from January 2019. This means our future sets to be much greener and cleaner, hurray! After the inspiring work of many community events and initiatives to reduce single use plastic around the region, this decision couldn’t have come at a better time. Congratulations to City of Darwin in taking this huge step forward. Just like quitting anything, it’s all about changing habits, making sure to pack reusable cutlery, coffee cups, plates, stainless steel straws and water bottles and always having them with you in your cars or bag. Simple, right? The benefits of phasing out single use plastic will reduce the amount of plastics being disposed to landfill or ending up as litter, reduce the impacts on the environment and human health, educate the community to shift away from single use plastic and support retailers already utilising alternatives. 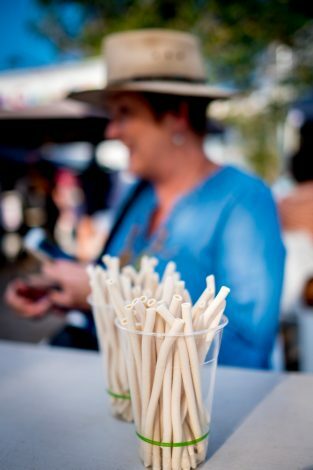 The trend has started, from pasta straws to colourful reusable bags now sold everywhere across the NT, to signs saying ‘sorry, no plastic straws here’! There is no stopping it now, so get on board and make those little changes at home and with your family. You will feel empowered and part of the movement making a huge difference to preserve the future of our beautiful tropical landscape and seaside. As co-founder and chair of Malak Marketplace, I was recently interviewed on the topic of banning single use plastic and asked what suggestions I had for other markets in the NT that hadn’t made the transition yet because of resistance from stallholders. My response was simply to impose the banning of single use plastic items from the markets as part of the stallholders’ permit conditions. Ask stallholders to watch A Plastic Ocean and employ a ‘Plastics Police’ team to assist the change; support, help and educate stallholders to work towards a collective common goal and vision. The vision we are working towards is having a bright, clean and non-toxic environment for our children and ourselves. The stallholders that do make the change notice more like-minded customers purchasing from them as they follow a common ethical code, think about our future, show sensitivity towards the topic and feel collectively empowered to make change happen.